SolsTiS® is an ultra-compact, automated, widely tunable, CW narrow linewidth Ti Sapphire laser system. Next-generation features lower cost while maximizing reliability, performance and productivity. Script / Story: Albion Bell Ltd.
Albion commissioned us to produce an animated explainer / demo video explaining the advantages of one of M Squared Lasers products, SolStis. SolsTiS provides narrow linewidth, high output power, broad tuning, and the lowest noise in the industry. Compatible with a wide range of commercial Ti Sapphire pump lasers as well as fully integrated pump options. The product and application is quite complex. We created an animated video based on a play in three acts scripted by the client, starring Dr. Hermann Bagel, a Quantum Optics post-doc at the Tassaleda Institute of Technology and Science. 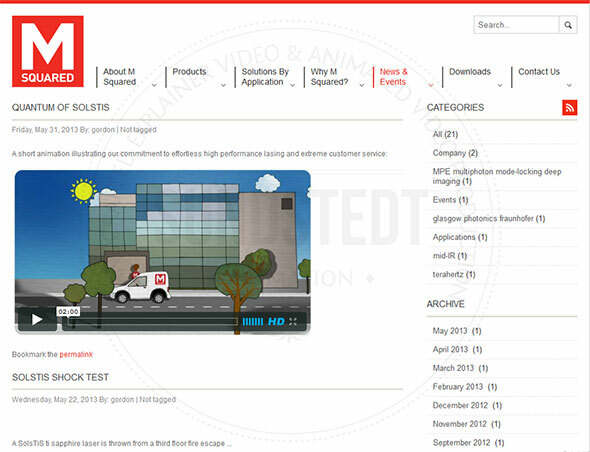 The animated video is illustrating the commitment to effortless high performance lasing and extreme customer service of M Squared Lasers. We used our own unique, character based, different 2D/2.5D visual style in the creation of this cartoon style animated explainer video. What makes our video more unique is our own 100% handcrafted design style. The short animated video starts with Dr. Bagel in his lab and ends in a triumph when we see Harmann standing in a suit presenting to a large audience of his peers at a conference. The entire animated video was animated in-house near Glasgow, Scotland at Sundstedt Animation. 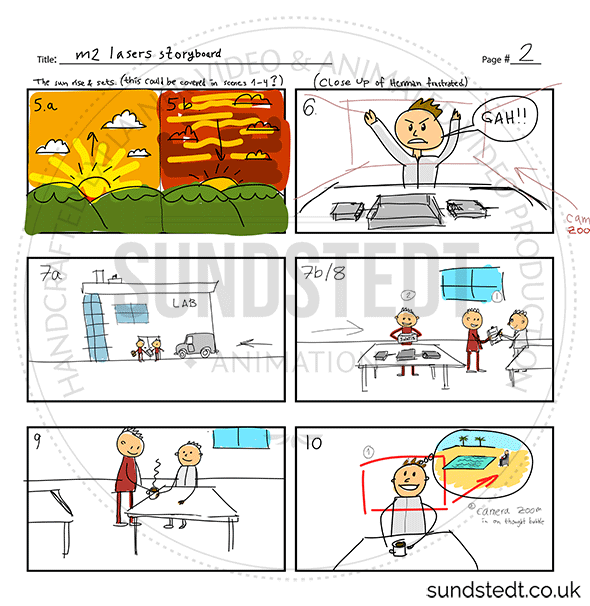 Sundstedt Animation created the sketched, colored storyboard and character designs at the start of production. The client also provided us with reference images from M Squared lasers, showing photographs of the very complex lasers systems that we used as reference for the cartoon illustration. 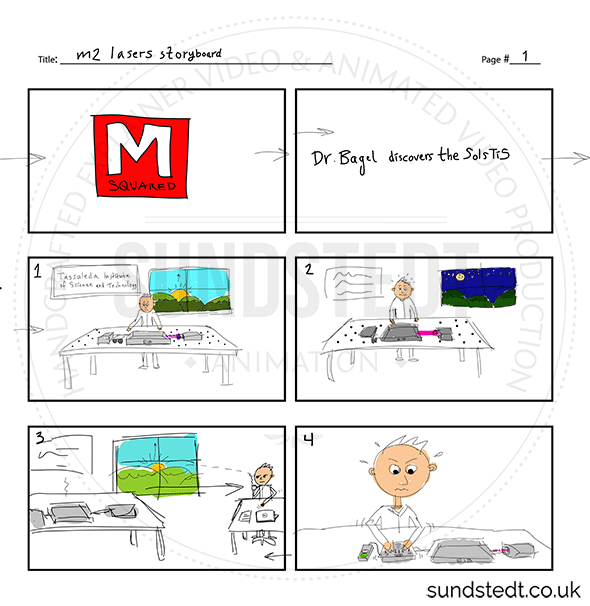 The marketing director at M Squared Lasers has told us we are very professional designers and animators and above all a deeply creative, bringing these qualities to the animated video project and a pleasure to work with, and with great results. We picked up the concept well and rendered it just the way we the client would have wanted. 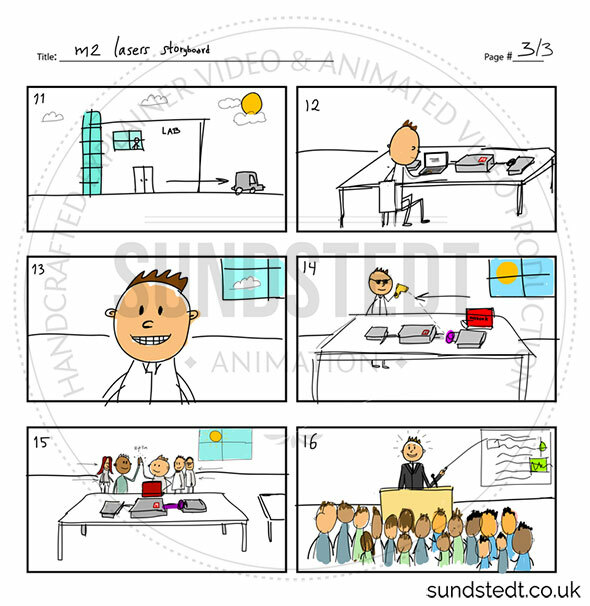 We produced the video quickly after the story board was agreed. There client was delighted with the result and has used the video both in social media, on the website and blog. 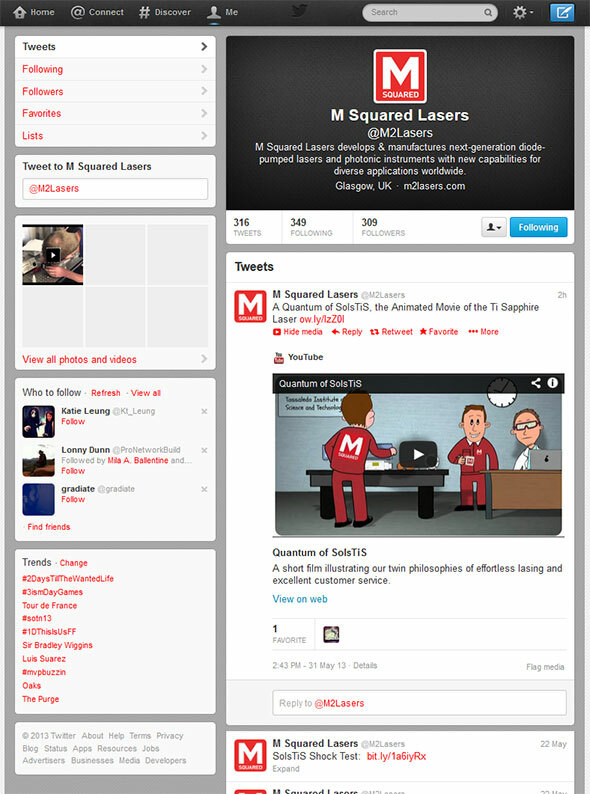 Now over three years later, the animated explainer video is still available on the M Squared Lasers YouTube landing page and in their website blog. “We commissioned Anders Sundstedt to produce an After Effects video to explain the advantages of one of our products. The product and application is quite complex. However Anders Sundstedt picked up the concept well and rendered it just the way we would have wanted. He produced the video quickly after the story board was agreed. M Squared Lasers has received one of the greatest accolades in British business – the Queen’s Award for Enterprise. Co-founders Dr Graeme Malcolm OBE and Dr Gareth Maker received the prestigious award from Her Majesty the Queen at Buckingham Palace. The photonics and lasers-tech firm was commended in the innovation category after developing one of the crucial pieces in the quantum technology jigsaw puzzle. Its SolsTiS platform is being used to construct the world’s most accurate clocks, conduct antimatter experimentation, and build spacecraft ‘ion-drives’. Other notable applications include the development of quantum computers and research into the properties of quantum mechanics in collaboration with the UK government’s new Quantum Hubs. M Squared is widely recognised as one of the major forces in the photonics industry, with sales exceeding £10m and annual growth at 40 per cent since it was established in 2006. The Glasgow-based business has grown into a team of of more than 80, with offices in three countries around the globe.